Legendary, 6 mana, 5/5, melee, Can only take 1 damage from a single source. Whenever this unit attacks gain +3/+0. Legendary, 4 mana, 4/4, melee, Add a Poisonous card to your opponent’s hand. Poisonous: 2 mana, Your Summoning Stone takes 4 damage if this card is in your hand at the end of your turn. Common, 4 mana, 3/3, ranged, All enemy units played on the same row as Rapacious Satyr take 2 damage. Epic, 6 mana, 7/4, melee, Your opponent can only play 1 card per turn. 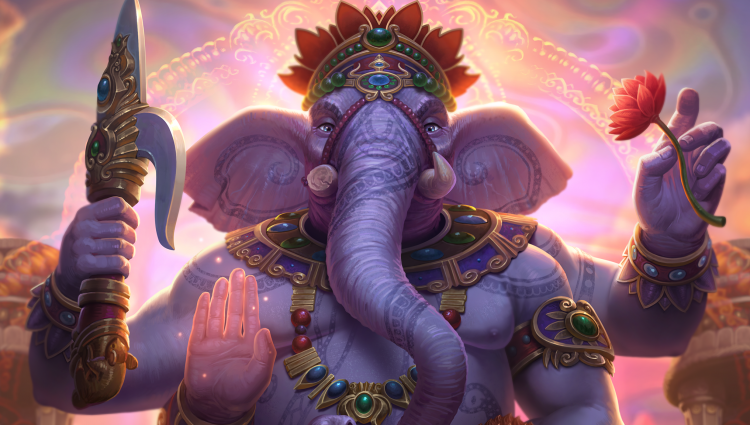 The Hindu Pantheon is Here! When this unit or spell would go to your graveyard return it to your hand. It loses reincarnate. Pillar of Life: 2 Mana, Deploy a Pillar of Life that heals a random friendly for 1 at the start of your turn. Common, 6 mana, 4/4, ranged, Warcry: Randomly deal 2 damage to enemies twice. Reincarnate: Costs (7) and your Warcry now hits three times. Epic, 6 Mana, Copy every friendly God in play and spawn an avatar of them. These avatars have <b>Charge</b> and die at the end of the turn. Common, 3 mana, 3/3, melee, Reincarnate: attacks now ignore immunities and protect. Common, 3 mana, Return a unit to its owner’s hand. Reincarnate: costs (4). Free, 3 mana, Deal 3 damage. Reincarnate: now deals 1 damage. Common, 3 mana, Give a unit +1/+1. Reincarnate: now gives +2/+2. Rare, 5 mana, Create a friendly clone of any unit in play. Legendary, 6 mana, 3/3, melee, Warcry: Kill a unit with 4 or more health. Reincarnate: +3/+3. Rare, 4 mana, 0/6, melee, Guard, Has 0 movement. Reincarnate: Gains +6/+0 and 3 Movement. Rare, 3 mana, Silence a friendly with Reincarnate then deal 5 damage to an Enemy unit. Common, 2 mana, Change ownership of two units with the same mana cost. Epic, 3 mana, structure, 0/3, The next card your enemy attempts to play is countered and this unit is killed. Can be deployed anywhere. Common, 3 mana, structure, 0/3, Whenever you play a structure, spawn a 2/2 Avatar with Charge. Can be deployed anywhere. Common, 2 mana, structure, 0/3, All enemies have their movement reduced by 1. Free, 2 mana, structure, 0/3, Can be deployed anywhere.Warcry: Banish a unit until this pillar is destroyed. Common, 2 mana, structure, 0/3, All friendlies you deploy gain +0/+2. Common, 2 mana, structure, 0/1, All enemy units have 1 less attack. Epic, 4 mana, structure, 0/7, Enemy Spells cost 1 more. Rare, 3 Mana, structure, 0/3, The next spell your opponent plays is copied and added to your hand and this pillar is destroyed. Can be deployed anywhere. Rare, 1 Mana, Discover the top three cards of your deck. Select one, place the others on the bottom of your deck. Free, 2 mana, 2/1, ranged, Your opponent cannot use their Leader Ability. Free, 1 mana, Give a friendly unit Protect: 1. Reincarnate: now gives Protect: 2. Epic, 3 mana, 1/1, melee, Reincarnate: gains +3/+3 and attacks now hit all adjacent enemies. Rare, 1 mana, Target the enemy Summoning Stone. Until the start of your next turn, Silence all Enemy units who end their turn adjacent to it. Spells that can be casted instantly such as the Mana Potion, now have a confirm state. This removes a lot of problems players were having with accidentally casting Instant Cast spells. Arena Level requirement changed from Level 3 to Level 1. Ranked requirements changed from Level 10 to Level 5. Attack increase from 4 to 5. Fixed an issue where units that had Charge and Warcry appeared with Warcry twice. Gold cards now always appear on the left of the default card in the collection.